Psalm 119:18 says, "OPEN my eyes so that I can see all the wonderful things in Your teachings." In past years, I've chosen a word that I hoped to focus on over the course of twelve months, but usually around month three I've forgotten the word and moved on. It's been a while since I've picked a word for the year, and had no intention of selecting one this year - and yet here I am. In 2017 my unofficial word was "survive" and 2018 felt more like "grow", but over the last few weeks I've felt like God has continually led me back to the idea of being OPEN in 2019. OPEN to what the Lord has next - we don't believe that adopting five kids was the only plan He has for us. And we don't want to get comfortable thinking, "Okay, we've done our big thing, we're good to retire from service now!" While we are aware that our biggest job at present is to continue to love, instruct, and disciple these five, we also want to be OPEN if He wants us to teach them by including them in doing and not just listening to us saying. OPEN to following Him outside of my comfort zone (again) - adopting five kids was never on my radar and certainly not in my comfort zone, so I find it funny that this is one of the areas that being OPEN has been impressed upon me because most people (myself included) would probably say that I have a lot of experience in doing just this. But here's what I also know - it's so easy to find a new level of comfort and stay there. OPEN to what He wants to teach me this year - again, a bit of a surprise because I feel like I've been on a crash course for the past few years in learning what I don't know and how much I need Him, but there's always room for more of Him and less of me. It's easy to think you've arrived and to begin to feel superior to others (at least, it's easy for me to feel that way), and I need God's painful reminders that I won't arrive this side of Heaven. OPEN our home up more often - this might just be the hardest one for me because it means relaxing my grip on my false sense of control. Things will get broken, messes will be made, and people will stand in my kitchen and get in my way...but that's just doing life together, right? This year I want to be intentional about inviting people in and practicing hospitality, offering encouragement, creating a safe environment to share concerns, and (most of all) boldly, but lovingly, giving Biblical responses that go against the grain of our society. I want our home to be a place where people see Jesus clearly reflected in our actions, reactions, words, and advice - not because we are amazing, but because HE is. 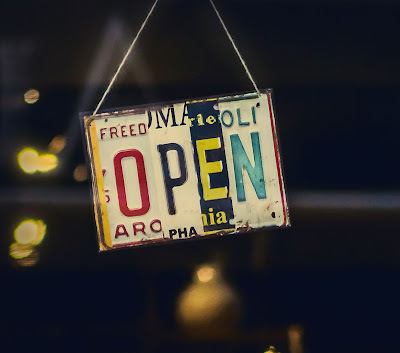 Choosing to be OPEN this year causes me to feel a bit like this sign in this image (which I did not take). The experiences, bumps, lessons, and people that God has placed in my life over the last 37 years have made me as unique as this sign - not pretty, but functional. Just as the maker of this sign had a plan in mind before welding it together, the Maker of me had a plan in place for my life long before I was born. And as He continues to OPEN my eyes to His story for me, I choose to be OPEN to what He will write in to this year's chapter. What about you? Do you have a theme, idea, or word for 2019?